The Student Case Competition is annually organized by FIR e.V. at RWTH together with a big partner company from the ICT or energy sector. This year it was conducted together with Ericsson and had a focus on new solutions for the energy sector. Students from the Institut polytechnique de Grenoble, the Warsaw University of Technology, the VIA University College, the RWTH Aachen University, Maastricht University and the Cologne University of Applied Science were invited to present their ideas for new business cases for the energy sector. Eleven interdisciplinary teams with more than 30 students studying computer science,engineering, marketing, psychology or design were formed and presented their ideas. Finally,the four best student teams, two from Denmark and two from Aachen, were invited to finalize their concepts at a workshop in Aachen. There, they had, apart from working on their presentations, also time to take part in the social and educational programme organized by FIR and the RWTH. The event was combined with the FINESCE General Meeting and the Open Day, so that the FINESCE project members had the opportunity to judge the work of the students and the participants of the Open Day were able to see the presentation of the winning team. All four teams gave great presentations of their business cases. Team "Rose” from Denmark showed an opportunity to organize the daily tasks of prosumers with a Smartphone app. Team micromanage’s idea was to build an app that allows the user to remote control all electronic devices and even to manage the electronic vehicle and Team EC2X showed opportunities for a secure data transmission by peer to peer networks. Finally the team Energetica with Henning Wilms and Julius Scheuber won the competition. Their business case is a miniaturized smart plug, which is not visible for the user and can be installed in new houses as well as in already existing installations. Through a Smartphone app,a combined services and the use of different sensors, it offers a smart energymanagement for every household. The winning team will now be able to start an interesting internship at Ericsson and, of course, they got prices, like iPads and headphones for their great work. 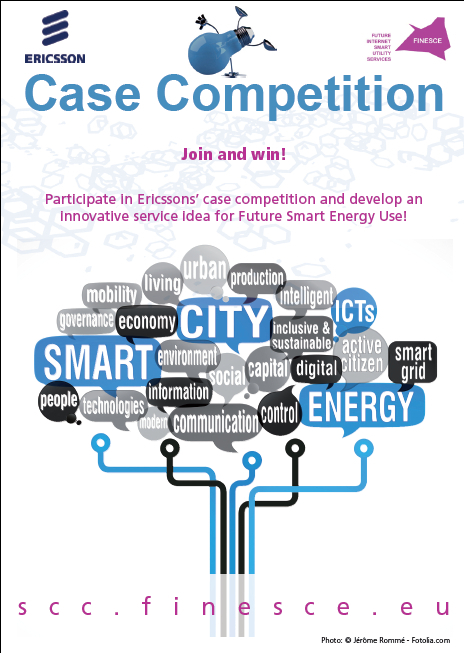 Here you can find the flyer of the Student Case Competition.